In Microsoft Dynamics CRM, rollup fields are designed to help users obtain insights into data by monitoring key business metrics. A rollup field contains an aggregate value computed over the records related to a specified record, such as open opportunities of an account. Also, you’ll be able to aggregate data from the activities directly related to a record, such as emails and appointments, and activities indirectly related to a record via the Activity Party entity. In more complex scenarios, you can aggregate data over the hierarchy of records. As an administrator or customizer, you can define rollup fields by using the customization tools in the CRM Web application, without needing a developer to write code. Wide selection of aggregate functions. You can aggregate data by using the following functions: SUM, COUNT, MIN, MAX and AVG. The field value is yet to be calculated. The field value has been calculated per the last update time in _date field. The field value calculation resulted in overflow error. The field value calculation failed due to an internal error. The following run of the calculation job will likely fix it. The field value calculation failed because the maximum number of retry attempts to calculate the value was exceeded due to high number of concurrency and locking conflicts. The field value calculation failed because the maximum hierarchy depth limit for the calculation was reached. The field value calculation failed because a recursive loop was detected in the hierarchy of the record. As a system administrator, you can modify the rollup job recurrence pattern, postpone, pause or resume the rollup job. However, you can’t cancel or delete a rollup job. To pause, postpone, resume or modify the recurrence pattern, go to Settings > System Jobs. In View, select Recurring System Jobs. On the nav bar, choose Actions and select the action you want. For the Mass Calculate Rollup Field job, the available selections are: Resume, Postpone, and Pause. For the Calculate Rollup Field job, the available selections are: Modify Recurrence, Resume, Postpone, and Pause. Let’s take a look at several rollup field scenarios. We’ll aggregate data for a record from the related records with and without using a hierarchy. We’ll also aggregate data for a record from related activities and activities indirectly related to a record via the Activitiy Party entity. In each example, we define the rollup field by using the Field Editor. To open the Field Editor, go to Settings > Customization > Customize data > Components > Entities. Select the entity you want and choose Fields. Choose New. In the editor, provide the required information for the field, including the Field Type and Data Type. In the Field Type, select Rollup, after you have selected the data type. The data types include decimal or whole numbers, currency, and date/time. Choose the Edit button next to the Field Type. This takes you to the rollup field definition editor. The rollup field definition consists of three sections: Source entity, Related entity and Aggregation. In the Source entity section, you specify the entity for which the rollup field is defined and whether or not you aggregate over a hierarchy. You can add filters with multiple conditions to specify the records in the hierarchy you want to use for rollup. In the Related entity section, you specify the entity over which you aggregate. This section is optional when you choose to rollup over the hierarchy on the source entity. You can add filters with multiple conditions to specify which related records to use in the calculation. For example, you include the revenue from the open opportunities with an annual revenue greater than $1000. In the Aggregate section, you specify the metric you want to compute. You can choose available aggregate functions, such as SUM, COUNT, MIN, MAX or AVG. In this example, a hierarchy is not used. 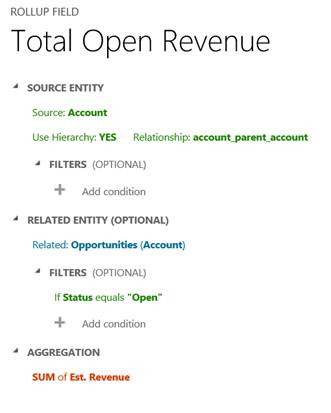 The total estimated revenue is calculated for an account, from the related open opportunities. In this example, we calculate the total estimated revenue of an opportunity including the child opportunities, over the hierarchy. 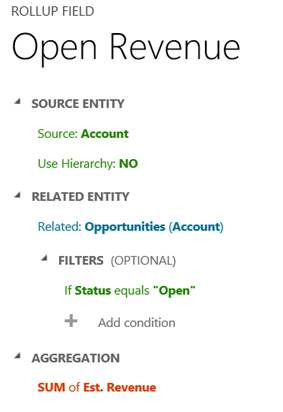 In this example, we calculate the total estimated revenue of open opportunities across all accounts, over the hierarchy. In this example, we calculate the total time spent and billed from all activities related to an account. This may include time spent on the phone, at appointments, or on custom activities. In earlier releases, you could define a rollup field for an individual activity, such as a phone call, fax, or appointment. But, to achieve the result of the example shown below, you had to total the data by using the calculated fields. 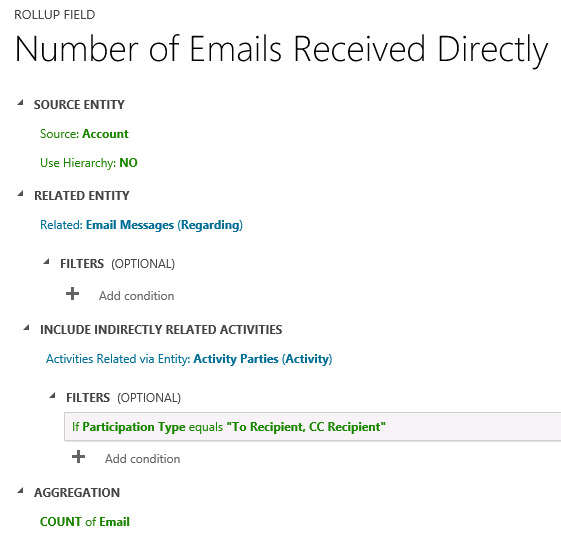 Now, you can do it all in one step by defining one rollup field for the Activity entity. In this example, we count the total number of emails sent to an account, where the account is listed on the email’s “To Recipient” line or “Cc Recipient line. 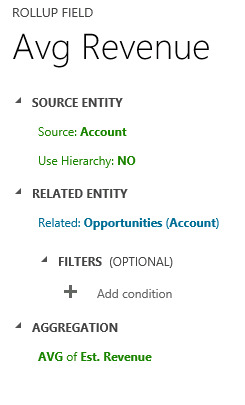 This is done by specifying the Participation Type in FILTERS for the Activity Party entity in the rollup field definition. If you don’t use filtering, then all available participation types for an activity are used in the calculation. 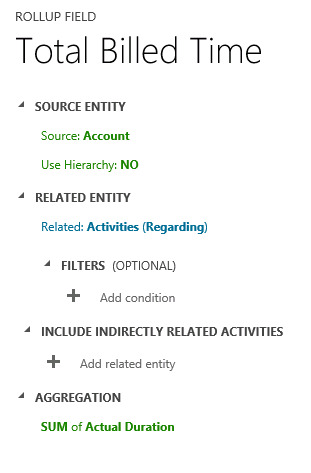 For more information about the Activity Party entity and participation types available for a particular activity, see MSDN: ActivityParty entity. 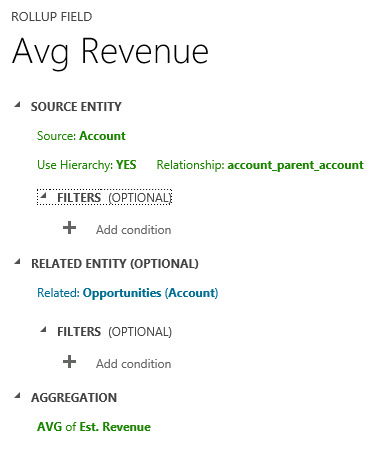 In this example, we calculate an average estimated revenue from all opportunities related to an account. 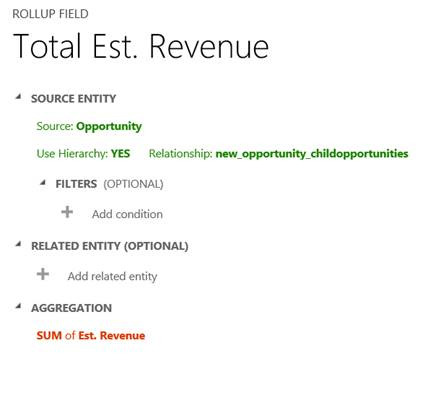 The following example shows how to calculate an average estimated revenue from related opportunities over a hierarchy of accounts. An average estimated revenue can be seen at each level in the hierarchy. You can define a maximum of 100 rollup fields for the organization and up to 10 rollup fields per entity. A rollup over the rollup field is not supported. A rollup can't reference a calculated field that uses another calculated field, even if all the fields of the other calculated field are on the current entity. The rollup can only apply filters to the source entity or related entities, simple fields or non-complex calculated fields. A rollup can be done only over related entities with the 1:N relationship. A rollup can’t be done over the N:N relationships. A rollup can’t be done over the 1:N relationship for the Activity entity or the Activity Party entity. The business rules, workflows or calculated fields always use the last calculated value of the rollup field. A rollup field is aggregated under the system user context. All users are able to see the same rollup field value. You can control the rollup field visibility with the field level security (FLS), by restricting who can access the rollup field. More information: Field level security. As you can see, the precision rounding to two decimal points on the aggregated field is done before the aggregation is performed. Certain entity forms, such as Account or Contact, out-of-the-box, contain the associated grids. For example, an Account form includes Contacts, Cases, Opportunities and other grids. Some of the records shown in the Account form grids are directly related to the account record; others, indirectly, through the relationships with other records. In comparison, the rollup field aggregation uses only direct relationships explicitly defined in the rollup field definition. No other relationships are considered. To illustrate the difference in behavior, let’s look at the following example. The account A1 has a primary contact, P1. The case C1 is associated with the account A1 (C1.Customer field = A1) and the case C2 is associated with the contact P1 (C2.Customer field = P1). The Cases grid on the Account form for the A1 record, shows two cases, C1 and C2. The rollup field on the account entity, called Total Number of Cases, is used to count the cases associated with the account. In the account rollup field definition, we specify the cases that have the Customer relationship with the account. After aggregation, the Total Number of Cases is equal to 1 (case C1). The case C2 is not included in the total, as it is directly related to the contact, not to the account, and can’t be explicitly defined in the account rollup field definition. As a result, the total number of cases returned by rollup operation doesn’t match the number of cases shown in the Cases grid.